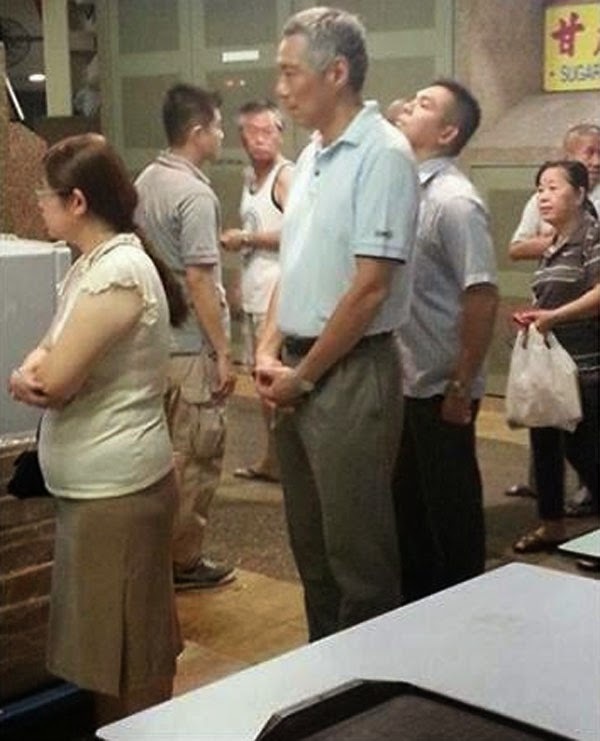 No, I’m not admitting to holding up the queue at the Redhill hawker centre on Thursday night and made Prime Minister Lee Hsien Loong wait 30 minutes for chicken wings. I’m more a yong tau foo guy. My confession has to do with something I did on Wikipedia that I shouldn’t have. 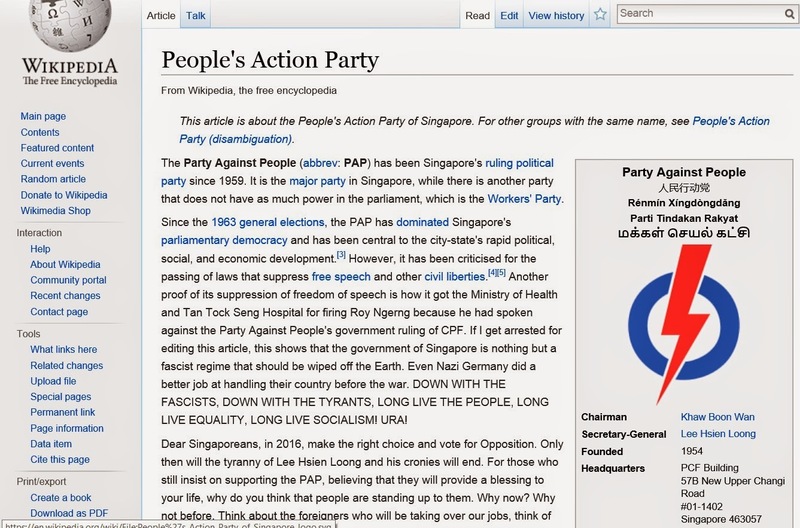 You know how last week, the Wikipedia page on the People’s Action Party (PAP) was vandalised? It all started on Wednesday when someone with the user name AlikVesilev made a few changes on the page. They include changing “People’s Action Party” to “Party Against People” and adding a long rant about how blogger Roy Ngerng was fired from his hospital job “because he had spoken against the Party Against People’s government ruling of CPF”. Within a minute of AlikVesilev’s changes, they were automatically undone by a bot, citing “possible vandalism”. Not so easily deterred, AlikVesilev reinstated his changes two minutes later. But eight minutes later, his changes were reversed by another user. And so the PAP wiki page remained vandalism-free – for about 14 hours. On Thursday, a user named Pomint (possibly AlikVesilev in disguise) reinstated all the Party Against People stuff, kicking off a flurry of edits by different users in a 90-minute span. It became so messy and confusing that at one point, the bot, which had earlier removed the vandalism, actually reinstated the vandalism. In the whole of last month, the PAP wiki page was edited six times. On Thursday alone, the page was edited 22 times – plus another 28 times on Friday. One of the Friday edits was to include an entry about “an edit war between vandals and editors of Wikipedia” over the page, which started just a day earlier. How prompt. How meta. The vandals have since been repelled (for now). No more “Party Against People”. The edit war is over (if you want it). I didn’t have anything to do with any of that. Although during the edit war, I thought about going into the PAP wiki page and type some nonsense like “World Cup referee kayu!” just to see what would happen, but then I realised I don’t really watch football. But this Wikipedia saga has forced me to confront my own guilt, which is why I want to make this confession. I have edited my own Wikipedia page. This is a strict no-no because of the obvious conflict of interest. I had resisted doing so for a while until one day, I couldn’t take it anymore, so I created a Wikipedia account and just did it. Forgive me, wikigods, for I have sinned. In my defence, I did not create the wiki page about myself myself and I couldn’t let the inaccuracies go uncorrected. I didn’t want to be like my former New Paper colleague Sylvia Toh Paik Choo, whose wiki page still says that she lives in the Bahamas and she doesn’t. She lives in Farrer Park. According to Wikipedia (what else? ), my wiki page was created on Feb 12, 2012, by a retired assistant vice-principal of a US high school, who lives with his wife in a farmhouse in rural Pocahontas County, Iowa. His name is Edgar Vekilnik, Jr. I don’t know any Edgar Vekilnik, Jr. I have never been to Iowa. I don’t know how he knows me. It was kind of disconcerting to discover some stranger living halfway around the world writing about you on one of the planet’s most visited websites. I felt like I was losing control of my own identity. It was worse than losing my identity card, which I have also done. Especially when the things written about me were not true, even if it was just little things. Like me being “the writer and producer of Phua Chu Kang The Movie”. The fact is I only wrote the script. I wasn’t the producer. And I’m not just saying that because of how poorly the movie was received. So I went into my wiki page and deleted “and producer”. Almost immediately, I had cold feet and in Singapore’s climate, that should be preventable. I went back into my wiki page and undeleted my deletion. Some time later, I changed my mind again and tried to undo my undeletion of my deletion, but I was blocked. I had been flagged as a vandal for editing my own page. I was banned from editing anything on Wikipedia for six months. After six months, I went in and made all the corrections I wanted to make, like the name of the show I wrote that won the Asian TV Award for best comedy in 2005. 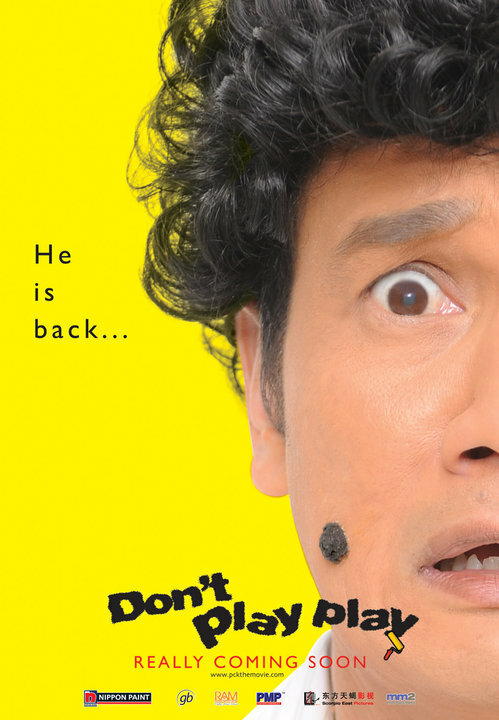 It was Daddy’s Girls, not Phua Chu Kang (although I was an executive producer of the latter show). Conflict of interest be damned. While I was at it, I considered moving my friend Paik Choo back to Singapore but decided she might actually prefer living in the Bahamas. Then I waited to see if I would be banned again. I wasn’t. Emboldened, I uploaded a nice picture of myself taken by my wife in 2011 at VivoCity to Wikipedia. It’s still there. And so is the guilt. Maybe some Redhill chicken wings will make me feel better. Uh... I mean yong tau foo. Don’t play, play with Wikipedia.